Hacking Team, the Italian surveillance firm that develops spyware and hacking software has been allegedly hacked by an unknown hacker and also exfiltrated 400 GB data from its server. At the mean time there is no response or comments came from Italian Surveillance firm. This is quit often why hackers have targeted Hacking Team, as they are been at center because of their surveillance solutions and service that they provides, but this could be the big question on the firm which provides such kinds of security services. On Sunday Eva Galperin, global policy analyst at the Electronic Frontier Foundation, shared the list of countries on twitter which said to be customers of the Italian Hacking Team. Another details came forward from the exploit activist Christopher Soghoian, that Chile had bought the surveillance software last year for $US2.85 million. Hackers team had leaked the stolen data on the torrents sites, which includes includes a huge number of directories containing source code, emails, and also audio recordings. Another pointing thing that came forward is that there is the Da Vinci surveillance platform, a software used by law enforcement agencies to spy on suspects. Moreover, attacker have also hacked the twitter accounts of the Surveillance firm Hacking Team and posted a tweet with a link of the all stolen emails, files and source code. 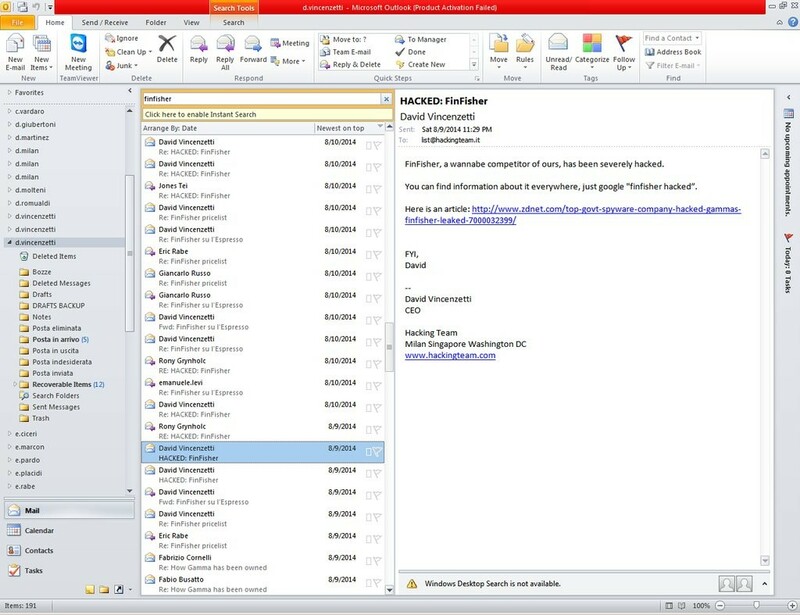 Attackers have also posted the screenshot which shows the CEO of hacking team David Vincenzetti share the news related the hacking of their competitor FinFisher, another powerful surveillance software developed by Gamma Group. Experts are analyzing the leaked data, we will update this post as we gets any updates on this.------- Stay Tuned.